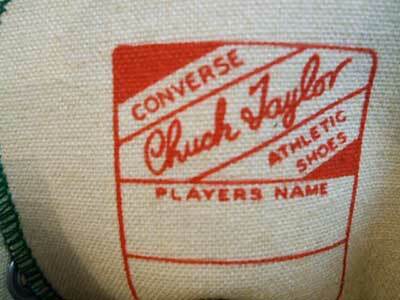 Vintage chucks had a name label printed inside the tongue. Although the Converse All Star Chuck Taylor high top basketball shoe has remained virtually unchanged since Chuck Taylor made his modifications in their design during the 1930s and 40s, there are some subtle differences in the way the shoes are manufactured and sold today. One difference is that today there no longer is a name label printed inside the tongue. The label said Converse Chuck Taylor Athletic Shoes, and below that there were two outlined rectangles, one labled “Players Name”. Vintage chucks had wider spacing between the side eyelets and smaller toe caps. There are also some differences on the outside of the shoe. The two side eyelets on the inside of each shoe were wider apart than they are today, the rubber toe caps were smaller, the thread stitching around the toe cap had a differenct pattern, and the rubber piping (red on the white chuck, black on most other models) was slightly thicker. The shoe laces that came with each pair were longer and made of a more stretchable cotton than the braided and shorter laces issued with each pair of chucks today. On the rear of each shoe, the label was blue, with a large white star containing the words “All Star”, and two smaller white stars. 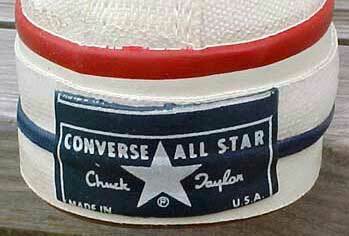 The upper left corner contained the word “CONVERSE”, the lower right corner had a Chuck Taylor signature, and the lower left corner contained the words “Made in U.S.A.”. Vintage black low cut chucks. Other vintage patch patterns as seen on black high tops are black on white. One is similar to the blue patch as described above, but the placement of the words is different. These patches were eventually replaced with today's design featuring black lettering on white rubber. The new patch says “ALL STAR” in much larger lettering, and a black star between the two words. Underneath the star is a trademark symbol (circled R) and the words Made in U.S.A. are slightly larger. The lettering and pattern on the inner cushion sole was different then. 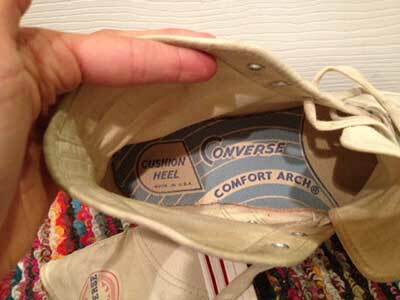 The cushion insole was much different, with more patterns and the words Converse, comfort arch, and Cushion Heel in larger lettering. The inside pattern and lettering has changed several times since then. The latest pairs manufactured feature the complete Chuck Taylor circle logo inside, although you still can buy pairs with the word Converse (star O), Made in U.S.A., and some shoe-like symbols. Vintage black high tops shown with their original box. Note that the ankle patch appears to be black and white only and the signature is on top of the star. If you have pictures or other information about vintage Chuck Taylors, please contact us at chucksphotos@chucksconnection.com. Attach any photos in jpeg or tiff format. Please note that we are not affiliated with the Converse Company and cannot provide estimates of the value of a vintage pair of shoes. Contact a licensed appraiser for that type of information. 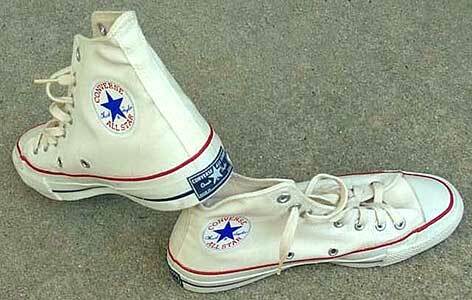 See our article and photo galleries on the Evolution of the Chuck Taylor for more information about vintage chucks. 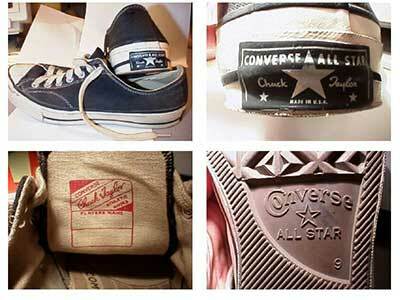 There are many photos of vintage chucks in our collectors gallery also.